Just 96 days since their launch, NASA’s twin Van Allen Probes have already provided new insights into the structure and behavior of the radiation belts that surround Earth, giving scientists a clearer understanding about the fundamental physical properties of these regions more than half a century after their discovery. In a press conference on Tuesday, Dec. 4 at the American Geophysical Union’s 2012 Fall Meeting in San Francisco, members of the Van Allen Probes science team discussed current findings made in unlocking the mysteries of the radiation belts. These two donut-shaped regions of high-energy and hazardous particles – named for their discoverer and the mission’s namesake, American physicist James Van Allen of the University of Iowa – are created by our planet’s magnetosphere, and can harm space technologies such as satellites, as well as affect human space travel. 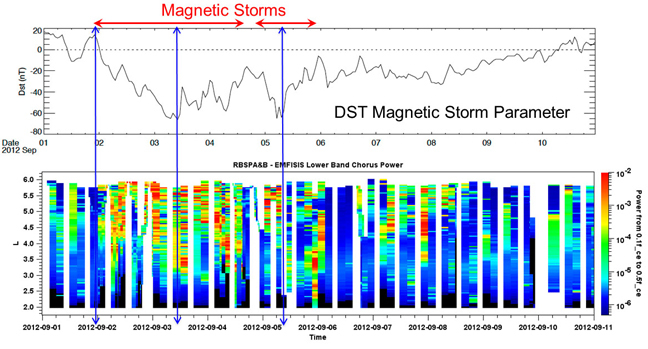 This high-cadence sampling data, taken by the Electric and Magnetic Field Instrument Suite and Integrated Science (EMFISIS) instruments on NASA's Van Allen Probes right after launch, reveals a strong correlation between chorus waves (the bird-like sounds recorded by EMFISIS) and disturbance storm time (DST), a value used to measure geomagnetic activity during magnetic storms. A drop in DST (top) can be seen to correlate with an increase in chorus activity (more red, orange, and yellow) in the bottom plot. This correlation may be central to the association of strong particle acceleration with some magnetic storms; scientists are working now to learn more about the exact processes at work. Credit: University of Iowa/NASA. The inner belt, where many satellites must operate, is home to the most hazardous and energized particles, mostly protons. “A staggering number of the spacecraft we rely upon daily have to spend a part of their orbit in the harshest area of Earth’s radiation environment,” says Joseph Mazur of the Aerospace Corporation, Principal Investigator of the probes’ Relativistic Proton Spectrometer (RPS). The Van Allen Probes are providing researchers with detailed views of how the populations of those particles vary with altitude, which should help engineers more effectively protect satellites. “This is the first time we’ve been able to measure the high energy particles in the heart of the radiation belts,” Mazur said. “We’re able to measure at the one billion electron volt level; particles at that energy are virtually impossible to shield against. They will easily penetrate half-inch thick aluminum plate.” Particles at that energy level are known to cause a range of damages to spacecraft, from physical degradation to instrument malfunctions and false readings. To view the presentations, including video and audio files, please click here. The Van Allen Probes are part of NASA's Living With a Star Program to explore aspects of the connected sun-Earth system that directly affect life and society. LWS is managed by the agency's Goddard Space Flight Center in Greenbelt, Md. APL built the twin spacecraft and manages the mission for NASA.